Platelet Rich Plasma (PRP) has been used in medicine for a number of years. It’s a “spill-over” from sports medicine into aesthetics medicine and skin rejuvenation. In the past few years it has entered the field of medical treatment of hair loss. In sports medicine it has been used to speed up healing and improve overall results following sports injury. It has proven very useful in the field. In recent years PRP has been more widely used and increasing number of studies support the role that PRP can play in various areas of medicine. To understand how it works, we need to look at the role that platelets play when the body sustains an injury or trauma. When the body sustains an injury, surgical or traumatic, it starts a chain reaction and platelets are often among the first cells on the scene to take charge. If injury leads to bleeding the platelets will first obtain hemoestasis – ie stop the bleeding. Stopping the bleeding is not enough as the injury needs to repaired. The platelets directly or indirectly lead to the release of various substances and signals that will form a vital part of further repair and healing. In normal whole blood the concentration of platelets is 150,000-400,000 platelets per microlitre of blood with an average of around 200,000 platelets/mcl. When whole blood is centrifuged around 45% of the volume will settle in the bottom of the blood tube as Red Blood Cells (RBC). Above RBC we find blood plasma. Plasma is the 55% of the volume of the whole blood that is lighter in weight and therefore floats above the RBC. The plasma also contains the platelets. We thus have 100% of the platelets in 55% of the volume – which translates to x1.8 higher concentration of platelets in the plasma than in the whole blood. This could and is principally Plalet-Rich-Plasma and it could be used “as is”. However, we can obtain even higher degrees of platelet-concentrations. If the plasma (the yellowish 55% volume floating above the RBC) is separated and spinned again, then the plasma will separate further into a lower portion of plasma with most/all of the platelets called PRP and a portion of plasma above with far less platelets which is termed Platelet-POOR-Plasma or PPP. Say if 20% of the lower portion is used we’d have a PRP with nearly x5 higher concentration of platelets as compared to whole blood. With such a high concentration of “repair/healing/growth/collagen-stimulating” cells injected into a relatively small area the area gets a boost that is far beyond what the tissue would otherwise receive in normal capillary blood vessels. A small volume (10-20 ml) of the patient’s blood is drawn just like when doing a normal blood test. The blood is processed/spinned according to a protocol which leads separation of whole blood into RBC and plasma (with roughly x1.8 higher platelets concentration). Some clinics may just inject this as their PRP treatment. At My Hair Clinic we use Dr PRP, GloFin and other brands and we have the option of getting highly concentrated plasma is so required. All PRP kits are FDA and/or CE approved. 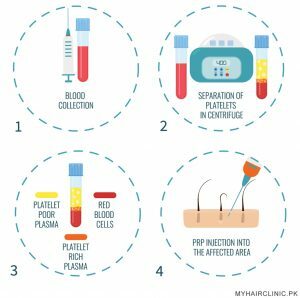 Once we’ve the required concentration of platelets, it’s then injected into the target area, ie the area with hair loss. The whole process takes around one hour depending on the specific purpose of treatment. The doctor will assess your situation and recommend a protocol for your situation. Can PRP be used in combination with microneedling? M-PRP during FUE hair transplantation? In both cases PRP is very useful along with a hair transplantation as many patients find the waiting period till hair growth appears unbearable. It can also be combined with microneedling to speed up the results even further. Still having questions about PRP? We understand it’s a big decision which is why many patients prefer to discuss their specific situation and their specific needs with us rather than making a decision from reading online. You are more than welcome to write us today and we’ll work together to find the solution that suits your needs.